, a celebrated Roman poet, was a native of Cordova, in Spain, where he was born Nov. lh> in the year 37. His father Annseus Mela, a Roman knight, a man of distinguished merit and interest in his country, was the youngest brother of Seneca the philosopher; and his mother, Acilia, was daughter of Acilius Lucanus, an eminent orator, from which our author took his name. 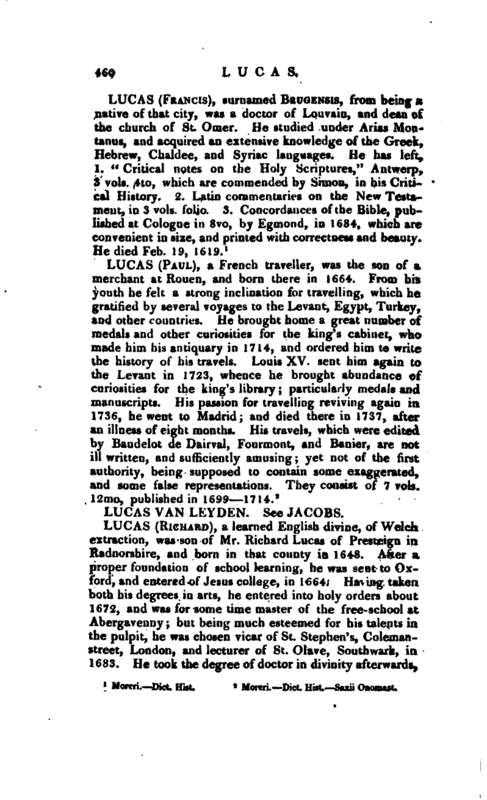 When only eight months old he was carried to Rome and carefully educated under the ablest masters in grammar and rhetoric, a circumstance which renders it singular that critics have endeavoured to impute the defects in his style to his being a Spaniard; but it is certain that his whole education was Roman. His first masters were Palaemon, the grammarian, and Flavius Virginius, the rhetorician. He then studied under Cornutus, from whom he imbibed the sentiments of the stoic school, and probably derived the lofty and free strain by which he is so much distinguished. It is said he completed his education at Athens. Seneca, then tutor to the emperor Nero, | obtained for him the office of quaestor: he was soon after admitted to the college of augurs, and considered to be in the full career of honour and opulence. He gave proofs of poetical talents at a very early age, and acquired reputation by several compositions; a circumstance peculiarly unfortunate for him, as it clashed with the vanity of the emperor, who valued himself on his powers as a poet and musician. 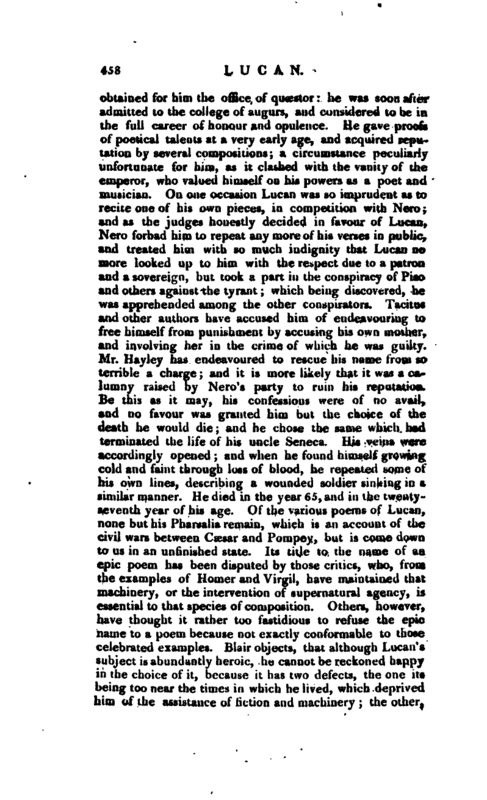 On one occasion Lucan was so imprudent as to recite one of his own pieces, in competition with Nero; and as the judges honestly decided in favour of Lucan, Nero forbad him to repeat any more of his verses in public, and treated him with so much indignity that Lucan no more looked up to him with the respect due to a patron and a sovereign, but took a part in the conspiracy of Piso and others against the tyrant; which being discovered, he was apprehended among the other conspirators. Tacitus and other authors have accused him of endeavouring to free himself from punishment by accusing his own mother, and involving her in the crime of which he was guilty. Mr. Hayley has endeavoured to rescue his name from so terrible a charge; and it is more likely that it was a calumny raised by Nero’s party to ruin his reputation. Be this as it may, his confessions were ofno avail, and no favour was granted him but the choice of the death he would die; and he chose the same which had terminated the life of his uncle Seneca. His veins were accordingly opened; and when he found himself growing cold and faint through loss of blood, he repeated some of his own lines, describing a wounded soldier sinking in a similar manner. He died in the year 65, and in the twentyseventh year of his age. Of the various poems of Lucan, none but his Pharsalia remain, which is an account of the civil wars between Caesar and Pompey, but is come down to us in an unfinished state. Its title to the name of an epic poem has been disputed by those critics, who, from the examples of Homer and Virgil, have maintained that machinery, or the intervention of supernatural agency, is essential to that species of composition. Others, however, have thought it rather too fastidious to refuse the epic name to a poem because not exactly conformable to those celebrated examples. Blair objects, tliat although Lucan’s subject is abundantly heroic, he cannot be reckoned happy in the choice of it, because it has two defects, the one its being too near the times in which he lived, which deprived him of the assistance of fiction and machinery; the other | that civil wars, especially when as fierce and cruel as those of the Romans, present too many shocking objects to be fit for epic poetry, gallant and honourable achievements being a more proper theme for the epic muse. But Lucan’s genius seems to delight in savage scenes, and he even goes out of his way to introduce a long episode of Marius and Sylla’s proscriptions, which abounds with all the forms of atrocious cruelty. On the merits of the poetry itself there are various opinions. 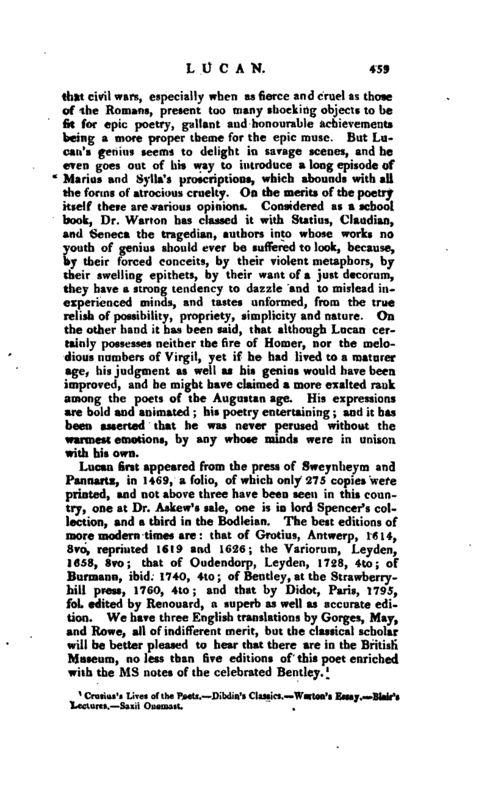 Considered as a school book, Dr. Warton has classed it with Statins, Claudian, and Seneca the tragedian, authors into whose works no youth of genius should ever be suffered to look, because, by their forced conceits, by their violent metaphors, by their swelling epithets, by their want of a just decorum, they have a strong tendency to dazzle and to mislead inexperienced minds, and tastes unformed, from the true relish of possibility, propriety, simplicity and nature. 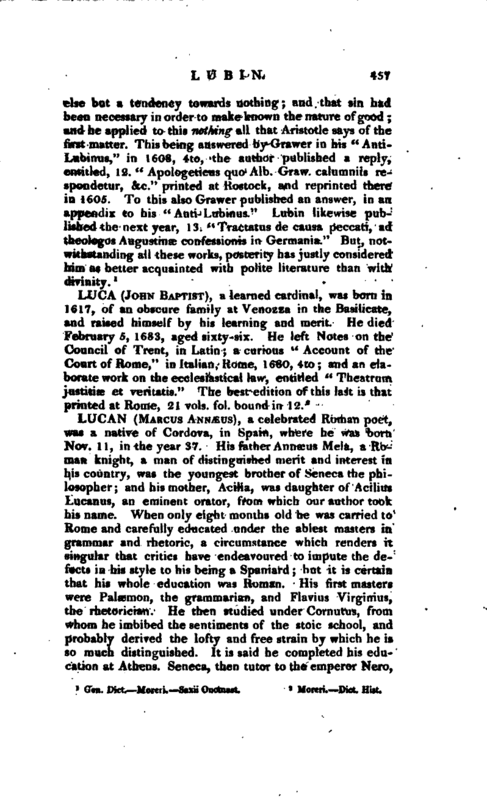 On the other hand it has been said, that although Lucan certainly possesses neither the fire of Homer, nor the melodious numbers of Virgil, yet if he had lived to a maturer age, his judgment as well as his genius would have been improved, and he might have claimed a more exalted rank among the poets of the Augustan age. His expressions are bold and animated; his poetry entertaining; and it has been asserted that he was never perused without the warmest emotions, by any whose minds were in unison with his own. Crusius’s Lives of the Poets. Dibdin’s Classics. Warton’s Essay, Blair’s Lectures. —Saxii Onomast.